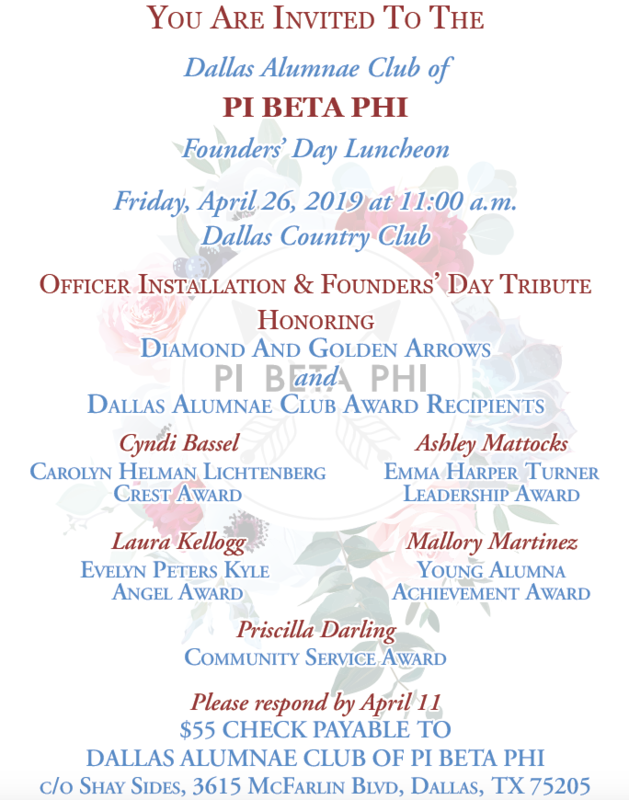 May 02, 2019 5:00 PM • Pi Beta Phi House 3101 Daniel Ave.
Daylight Angels are age 40+, married and unmarried, with and without children, stay-at-home moms, career women raising families, community volunteers, civic leaders empty nesters and retirees. All different ages, but all Pi Phis at heart. Shining Arrows members are primarily between the ages of 25 and 40. We are married, unmarried, with and without young children, career women getting new business off and running, stay-at-home moms and multitasking experts for all that life brings at this stage. The mission of Pi Beta Phi Fraternity for Women is to promote friendship, develop women of intellect and integrity, culvate leadership potential and enrich lives through community service. Finally . . . whatsoever things are true, whatsoever things are honest, whatsoever things are just, whatsoever things are pure, whatsoever things are lovely, whatsoever things are of good report; if there be any virtue, and if there be any praise, think on these things.